Aim: Junctional ectopic tachycardia (JET) is a postoperative complication with a mortality rate of up to 14% after surgery for congenital heart disease. This study evaluated the risk factors of JET and explored the association of postoperative temporary third degree atrioventricular (AV) block and the occurrence of JET. Materials and Methods: Data were collected retrospectively from 1158 patients who underwent surgery for congenital heart disease. Results: The overall incidence of JET was 2.8%. Temporary third degree AV block occurred in 1.6% of cases. Permanent third degree AV block requiring pacemaker implantation occurred in 1% of cases. In all, 56% of patients with JET had temporary AV block (P < 0.001), whereas no case of postoperative JET was reported in patients with permanent AV block (P = 0.56). temporary third degree AV block did not suffer from JET. Conclusions: A correlation between temporary third degree AV block and postoperative JET could be observed. The risk factors identified for JET include younger age groups at the time of surgery, longer aortic cross clamping time and surgical procedures in proximity to the AV node. Several studies and case reports refer to the causes of congenital JET one of which explores the possible association of congenital AV block and JET. These studies outline the importance of AV node or His bundle tissue degeneration for the developement of a congenital JET. ,,, The origin of AV nodal impairment is obviously different in congenital and postoperative JET. As AV nodal or His bundle tissue impairment occurs in both etiologies, an association of JET and postoperative temporary AV block is plausible. This is the first trial evaluating the association of temporary complete AV block and postoperative JET. The data of 1158 consecutive patients, who underwent surgery for congenital heart disease, at the University of Leipzig, Heart Center from 2006 to 2010 were studied retrospectively. Following surgery, all patients were admitted to the pediatric intensive care unit. For continuous electrocardiographic and hemodynamic monitoring, portable Siemens SC 9000XC monitors were used. All electrocardiograph (ECG) data were stored automatically. Patients below the age of 18 years who received open heart surgery and cardiopulmonary bypass were included. Patients without direct opening of either atrial or ventricular myocardium, that is surgery for coarctation of the aorta, Glenn anastomosis or placement of an epicardial pacemaker were excluded. In those patients neither cardiopulmonary bypass is required nor any mechanical influence on the nodal or perinodal tissue takes place. All patient's data were analyzed in respect of the occurrence of temporary or permanent third degree AV block, as well as the occurrence of JET. The JET was defined as narrow complex tachycardia of more than 150 bpm with AV dissociation and a ventricular rate exceeding the atrial rate or retrograde 1:1 association. Whenever JET was suspected, a 12-lead ECG as well as an atrial electrogram via the temporary pacing leads was obtained. Temporary and permanent third degree AV blocks were defined as third degree AV block lasting 7 days or less and permanent AV block was defined as third degree AV block lasting for more than 7 days. ECG`s from one hour after cardiopulmonary bypass to the end of the postoperative hospitalization were included. All postoperative ECGs were re-evaluated by two experienced pediatric cardiologists to confirm the diagnosis. In addition, JET specific therapy (hypothermia, muscle relaxants, amiodarone and pacing) was documented and analyzed. The duration of cardiopulmonary bypass, aortic cross clamping time and minimal body temperature during cardiopulmonary bypass were evaluated. Following surgery, all patients were treated with low to medium doses of inotropes (Milrinone, Dobutamine) for at least one day. Statistical analysis was carried out with the help a software package called Statistical Package for the Social Sciences (SPSS Version 21.0). Where appropriate, Chi square tests or Fisher's exact tests were used for discrete variables. Relations between JET and supposed risk factor for the occurrence of JET were assessed by logistic regression analyses. Significant variables in univariate analysis were included into a multivariable model. P values < 0.05 were considered statistically significant. 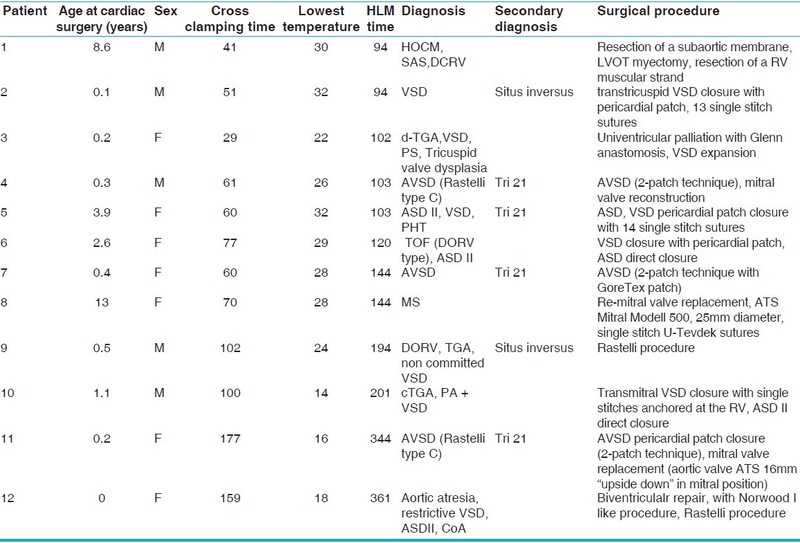 The characteristic features of the patients are reported in [Table 1]. In all, 1158 patients were included. The median age at operation was 2.78 years (0-224 months). There were 53% male patients versus 47% female patients. Age distribution showed a dominance of patients below the age of one year with 58% (n = 674), followed by 22% (n = 261) of patients between 1 and 5 years of age, 11% (n = 124) from 6-10 years of age and 9% (n = 99) of patients with an age of 11-18 years. The in-hospital mortality rate of this study population was 0.17%. There was no JET-associated death. In all, 32 patients with JET, 18 patients (1.6%) with temporary third degree AV block and 12 patients (1%) with permanent third degree AV block were identified [Table 2]. The combination of temporary third degree AV block and JET was observed in 56% (18/32) of patients. There were no patients with permanent AV block and JET (0/32) [Figure 1]. Temporary external pacing was performed on 20 patients with JET. Relaxation was used in 11 patients, amiodarone in 9 patients and therapeutical hypothermia was used in 7 patients [Table 3]. The incidence of surgical closure of ventricular septal defect (alone or in combination with another procedure) and JET was 74.3% (26/32). The AV block was always recognized before the occurrence of a JET. There were no patients diagnosed with JET who developed a late AV block. Data analysis showed a highly significant association of JET and postoperative temporary third degree AV block (P < 0.001). There were no patients with JET and permanent third degree AV block (P = 0.56). However, this result did not reach the level of statistical significance due to the very small number of 14 patients with permanent AV block in contrast to 1144 patients without permanent AV block. 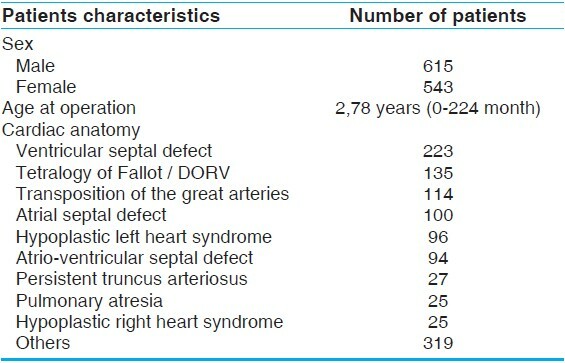 There was a significant correlation of postoperative JET and surgical procedures including closure of ventricular septal defect (P = 0.001/OR 4.0 (1.72-9.33)). Analyzing data for further risk factors, showed that a lower age at operation, with a median of 2.9 months in patients with JET and 12.5 months for patients without JET, was a statistically significant risk factor (P < 0.018/OR 0.74 (0.58-0.95). In addition, aortic cross clamping time of 63 minutes in patients with JET versus 47 minutes in patients without JET (P = 0.003/OR 1.01 (1.01-1.02)) was also identified as a risk factor. Time on cardiopulmonary bypass with 117 minutes in patients with JET versus 91 minutes in patients without JET (P < 0.16/OR 1.0 (1.0-0.99)) was not identified as a significant risk factor for the occurrence of postoperative JET. In a multivariable model only aortic cross clamping time (P < 0.02) showed statistical significance. 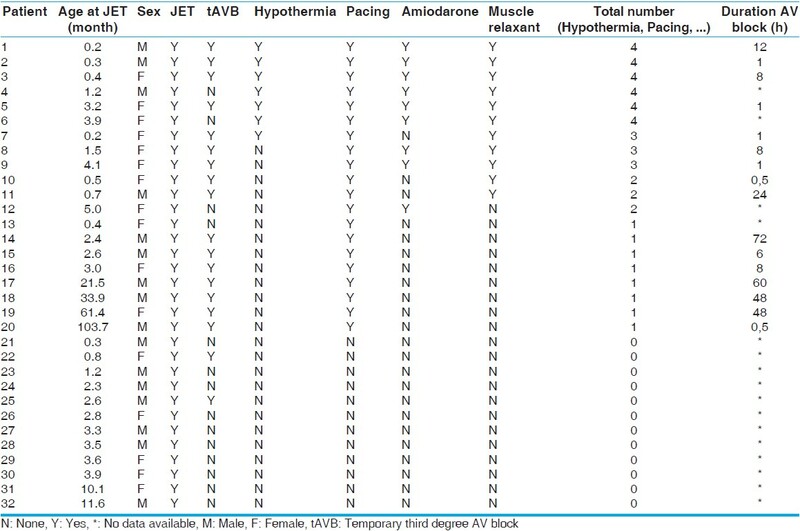 As shown in [Table 4], no statistically significant association among JET, gender and lowest temperature on cardiopulmonary bypass could be established. This is the first study evaluating the association of temporary AV block after surgery for congenital heart disease and the occurrence of postoperative JET. Additionally, risk factors for the occurrence of JET were evaluated in a large cohort and compared to hitherto published data. As outlined before, an association of JET and AV nodal or His bundle tissue degeneration or subtotal tissue damage seems to exist. The mechanism of postoperative JET was hypothesized as being due to regional edema through direct or indirect tissue damage or stretch in the region of hisian tissue with consequent abnormal automaticity. Interestingly, JET seems to be strictly associated with temporary third degree AV block as in this study not a single JET was diagnosed in a patient with permanent third degree AV block. This may be explained by the fact that permanent third degree AV block is thought to be caused by His bundle or infrahisian tissue damage, whereas temporary third degree AV block is rather due to suprahisian tissue damage. Different effects of damage to suprahisian versus His bundle/infrahisian tissue are routinely demonstrated during slow pathway modulation in the EP laboratory. Induction of thermal injury in the suprahisian region leads to the induction of an accelerated junctional rhythm, whereas if His bundle/infrahisian tissue is affected, a permanent AV block without junctional rhythm occurs. Consequently it seems obvious that local stress during a surgical procedure will produce similar effects. In [Table 3], all patients with JET and their individual therapy are depicted. Therapy is introduced in a step-by-step manner. Patients undergoing combined therapy are affected more severely than those requiring only one therapeutical option. Although the data obtained about the duration of a temporary AV block was incomplete, the last column indicates that shorter the period of temporary third degree AV block, the patient was more affected by JET. This supports the hypothesis that a mild manipulation such as a mere strain of the tissue can trigger this arrhythmia as against severe manipulation with real tissue damage. As a consequence, perhaps the occurrence of a postoperative permanent third degree AV block is a negative predictive factor of postoperative JET. Similarly, the occurrence of JET in a patient with complete AV block after surgery for congenital heart disease seems to predict the restoration of AV conduction. However, there is insufficient statistical power due to the sample size of this study group. Further studies are needed to verify this assumption. The presented data confirm some of the hitherto published risk factors for the occurrence of postoperative JET. In substance, younger age at operation and aortic cross clamping time could be verified in this collective study. Previous studies directed by Mildh et al. and Hoffman et al. included considerably fewer patients than our study. Although both authors' institutions are likely to use slightly different surgical techniques as well as a divergent postoperative management, they report similar findings. , As an obvious difference, both studies report a higher incidence of JET than the presented study. As the cutoff heart rate of 150 bpm to meet the diagnosis of JET was relatively high compared to other studies some patients with JET at lower heart rates might not have been diagnosed correctly. Despite these facts, there are arguments supporting the presented results. First of all, the higher heart rate cut off was set to identify primarily hemodynamic relevant tachycardias. In view of the fluent transition to the mostly well tolerated accelerated junctional rhythm, the exact incidence of a clinically relevant JET in the different study collectives is difficult to identify, as we do not know how many of these "slow" JETs were included in other collectives. Secondly, our data implies the occurrence of JET seems to be highly influenced by direct manipulation in the AV nodal region during surgery. Divergent surgical techniques may result in a different incidence of postoperative JET. This was a nonrandomized, retrospective, observational study. The authors cannot exclude the possibility that some arrhythmias might not have been documented in case of unfavorable monitor and alarm settings or failure to recognize JET. Furthermore, the retrospective analysis did not allow to identify the exact doses of catecholaminergic support provided in each individual patient, although these might have an effect on the occurrence of JET. In summary we state that there is a significant association of temporary third degree AV block and postoperative JET. Surgical procedures with proximity to the AV node are a risk factor for postoperative JET. Other predicting factors of JET were young age at operation and longer aortic cross clamping time. Prospective and multicenter data are still lacking and larger systematic surveys are needed. We thank Jacqueline Richter for constant motivation and organizational support and Bettina Müller for linguistic support. Hoffman TM, Bush DM, Wernovsky G, Cohen MI, Wieland TS, Gaynor JW, et al. Postoperative junctional ectopic tachycardia in children: Incidence, risk factors, and treatment. Ann Thorac Surg 2002;74:1607-11. Janousek J, Vojtovic P, Gebauer RA. Use of a modified, commercially available temporary pacemaker for R wave synchronized atrial pacing in postoperative junctional ectopic tachycardia. Pacing Clin Electrophysiol 2003;26(2 Pt 1):579-86. Dodge-Khatami A, Miller OI, Anderson RH, Goldman AP, Gil-Jaurena JM, Elliott MJ, et al. Surgical substrates of postoperative junctional ectopic tachycardia in congenital heart defects. J Thorac Cardiovasc Surg 2002;123:624-30. Bonnati V, Agnetti A, Squarcia U. Early and late postoperative complete heart block in pediatric patients submitted to open heart surgery for congenital heart disease. Pediatr Med Chir 1998;20:181-6. Nishimura RA, Callahan MJ, Holmes DR Jr, Gersh BJ, Driscoll DJ, Trusty JM, et al. Transient atrioventricular block after open-heart surgery for congenital heart disease. Am J Cardiol 1984;53:198-201. Lin A, Mahle WT, Frias PA, Fischbach PS, Kogon BE, Kanter KR, et al. Early and delayed atrioventricular conduction block after routine surgery for congenital heart disease. J Thorac Cardiovasc Surg 2010;140:158-60. Garson A Jr, Gillette PC. Junctional ectopic tachycardia in children: Electrocardiography, electrophysiology and pharmacologic response. Am J Cardiol 1979;44:298-302. Henneveld H, Hutter P, Bink-Boelkens M, Sreeram N. Junctional ectopic tachycardia evolving into complete heart block. Heart 1998;80:627-8. Laurent M, Almange C, Biron Y, Coeurderoy A, Foulgoc JL, Rauol PY, et al. Junctional ectopic tachycardia in a young woman with chronic complete heart block. Am Heart J 1986;111:597-9. Dubin AM, Cuneo BF, Strasburger JF, Wakai RT, Van Hare GF, Rosenthal DN. Congenital junctional ectopic tachycardia and congenital complete atrioventricular block: A shared etiology? Heart Rhythm 2005;2:313-5.